The result is a structure that resembles the Conestoga wagons used during early American westward expansion. The components of the shelter can then be easily assembled or disassembled on site and transported with ease. 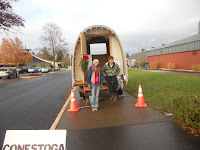 This creates the opportunity for residents to participate in the process of establishing their own shelter, drawing a reference to the rugged individualism again linked with the Conestoga wagon. Eric de Buhr of the Tine Hive developed the concept last winter as an economical and functional means of shelter at the Occupy Camp. In the past few weeks a small group has refining the design, making the hut slightly larger and more aesthetic. The purpose of building these huts is to expand St. Vincent De Paul’s (SVDP) existing car camping program, which already allows one to three RVs or tents to stay on land hosted by faith communities, businesses, non-profit organizations, or governmental offices. SVDP has the capacity to manage an additional 10 sites. Placing huts on these sites will provide more unhoused citizens a safe and secure place to be in Eugene. 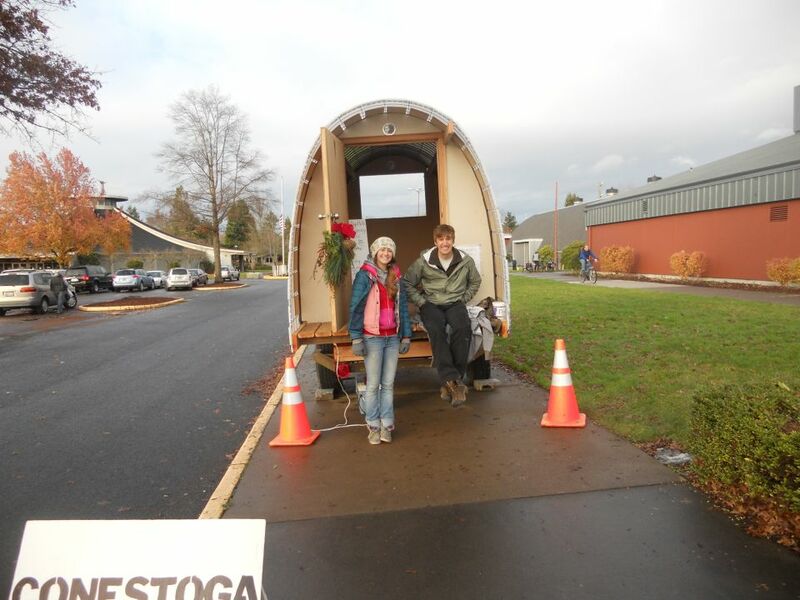 We have been carting this first hut around the city in an effort to garner support for building a lot more of them. So far it has been set up at the Park Blocks before a City Council meeting and then just outside the Holiday Market (shown in the picture above). The reaction from the larger community has been overwhelmingly positive. Don Dezarn, president of Pacific Headwear, has donated the money needed to construct 10 huts and has challenged other local business owners to match his contribution, resulting in over $18,000 in donations in just a couple week. We have also received a flood of e-mail from groups and individuals interested in helping to build the huts or donate materials. 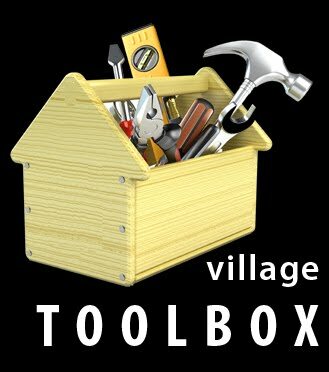 The non-profit Opportunity Village Eugene (OVE) sees this as a chance to incrementally begin to realize our vision for a village of simple micro-houses. City Council has recently approved a pilot project for such a village at 111 North Garfield Street, but the process for approving a conditional use permit may take 4 to 6 more months. Establishing small groupings of huts on camping sites throughout the city will provide the chance to lay an initial physical and social foundation for the village. In a few months, the huts could then be disassembled and relocated to the Garfield site, which will allow residents to obtain the benefits of living in community rather than being isolated to small groups across the city. If someone moves to the village in a Conestoga and then works to construct a more advanced structure, what we are calling a “second settler,” the hut could then be disassembled and rotated out to a new or existing camping site. The satellite camping sites could then serve as a waiting list and transitional zone between the street and the village. Conestoga hut is absolutely adorable! Amazing! I am too late to post a comment here but learnt new ideas from your post. I knew metal wire roof that is curved to connect to the long sides of the floor is one of the component of the hut. But I can use this idea while roof repairing in Maryland. Your take on the subject is wonderful. I agree with your opinion. Hope to read more on http://www.listoutdoor.com/top-10-camping-tent-review-2017/ to increase my knowledge in this field.